Today 24.03.2001 is 80 years of age to Russia outstanding grandmaster V.Smyslov! It is amusingly that he older than Victor Korchnoi on 10 years without one day! Vasyly Smyslov came to the fore of leading soviet chess players just before the war. Should be especially noted the 3rd place on the match-tournament for a title of Absolute USSR Champion in spring 1941 although the expediency of providing such an event still arouse a bewilderment to many people since the purpose of such an action is obvious - a rehabilitation of M.Botvinnik for a failure in the ∙II USSR Championship. Just after the war conclusion Smyslov obtains a rather important success - he is the 3rd on the most prominent International tournament in the Dutch Groningen after M.Botvinnik and M.Eive. This at once allowed him to enter in the chess elite and to gain the right to take part in the Candidates' match-tournament for a new World Champion in connection with Alekhin's decease. And Smyslov makes one more step to the top - he is the second already, letting pass only Botvinnik and ahead of P.Keres, S.Reshevsky and M.Eive. Two years later Smyslov - only the third in the Match-tournament in Budapest, but at the same time in 1953 in Zurich he wins confidently breaking away from the competitors on two points and gains the right on the match with the World Champion M.Botvinnik. Since this time begins their great opposition. Their duels - only 3 - were remarkable for a perseverance and absence of compromise and brought in the upshot an equal result. Either of them won a match and one match (the first) ended in a draw 12:12. It is interesting that first confidently leading was Botvinnik, gaining at the start 3 victories (from 6 games) but then the candidate obtains 4.5 points out of 5 games and goes ahead. Many specialists believed that Smyslov used an Alekhin's recommendation, who was going to play against Botvinnik (in a presupposed match) the sharpest variations in the French Defence (a proprietary Botvinnik's weapon) in order to force him to turn to the open openings. Nevertheless the World Champion managed to level the score and then go 2 points ahead. At the expense of incredible efforts Smyslov succeeded to equalize but on something more he had neither forces nor nerves. The final 24th duel proceeded rather calm and ended peacefully. 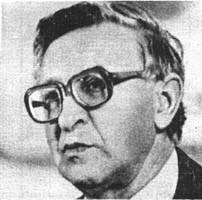 As a result Botvinnik kept his title. However Vasily V. has not gave up the ambitious intentions to conquer the chess crown. Two years later in a match-tournament he is confidently the first again with 1.5 points ahead of P.Keres. And now in the duel with Botvinnik he dictates his will. The second opposite finishes with a full triumph of the candidate - he wins with a superiority of 3 points. One year later in accordance with of those times rules took place a match-revenge. Botvinnik carried out a big work in a preparation to this event devoting an attention to programming the rival's creation. As to Smyslov - his failure in the final match with Botvinnik could be explained with different reasons. Possibly Vasily V. has not supposed that Botvinnik will be able to make up his mind seriously on a revenge - Botvinnik was 46 years old already! Besides Smyslov has not possessed of a big charge of sports spite and won at the expense of his talent, high technique and erudition. We should not exclude that the reaching the tops of chess Olympus weakened the seventh World Champion and he was punished for this. In those ages Smyslov differed from others USSR chess leaders in one circumstance - in essence he was a chess professional. In those years this was not welcomed by governing body - one considered that a sportsman should have a profession. He was forced to prove that one should devote everything to chess to obtain the big successes in top chess level. Smyslov had one more hobby - singing and he spent rather much time to this flame. Every year became more and more difficult to fight for a climb to chess Olympus. The post-war years pulled out to a chess crown pedestal a whole cohort of outstanding grandmasters. As a representative of a classic style in chess Smyslov rather rare failed. Especially reliably he played in the team events. 10 (!) time he was a member of the USSR team which won the Olympic gold. Smyslov by himself considered that in chess he is attracted by seeks of truth. The beauty of his creation was mostly in the simplicity of thoughts. Once upon a time Eive said so: "The moves made by Smyslov can be made by any other player, but only Smyslov wins." His last assault of chess Olymp was undertaken when he was more than 60!! He passed to a final candidates match and made a way only for Kasparov. The 7th world champion was 63 at that time. Funny thing took place during the quarter-final of that cycle in which Smyslov was playing with Hubner. Their match ended in a draw and all was left to a roulette wheel. Partners chose the colours of their national flags - Smyslov red, Hubner black. And first there was zero!! So they joked that it was the only fair in this situation. And only for the second time Smyslov had the good luck. In the next round he defeat Z.Ribli with confidence. Smyslov made a lot to develop chess theory. His system in the Gruenfeld defence is one of the most actual variations. He is a virtuoso in endings and also a chess composer. So, I would like to wish Vasilij good health and long years!! White: Kb4, Rg3, pp a6,f2. Black: Kb1, Rd2, pp a2,g5.